The base of content at the website is huge. Just scroll down the homepage and you’ll see a bunch of links that lead you to different sections of the website. This is an informative and transparent service, so that’s a big plus. The list of services is rather extensive. CustomWritings delivers essays, research papers, thesis papers, term papers, dissertations, coursework, creative writing, critical thinking, grant proposals, capstone projects, admission papers, and more. The guarantees, featured at a separate page of the site, include: money back policy, free revisions, great level of privacy, and plagiarism-free results. The prices seemed fair at first sight. The lowest price (for a high-school level paper with a deadline of 14 days) is $10, and the highest quote per page is $48, set for doctoral level with a deadline of 24 hours. I opted for Undergrad (years 3-4) level with a deadline of 7 days, so my quote was $17 per page. There are no beginner’s discounts, but the prices are affordable to begin with. Returning users get up to 15% lifetime price reductions when they accumulate $2000 throughout their orders. The paper I received was not perfect, but it still left a good impression. I checked it through Copyscape, and the result was 3% plagiarism. That could have been irrelevant if the author forgot to reference a source, but I discovered that most of the content was paraphrased from the online source the tool detected. I paid for custom writing, not rewriting services. The fact that the papers are not written by native US writers is also disappointing. The live chat feature is not accessible during weekends, but I could still get in touch with the agents on working days. They were nice and friendly, but didn’t help much when I complained about the paraphrased paper. They told me the writer could fix the part recognized by Copyscape, but the content was considered original as long as it wasn’t recognized by the tool. The blog is highly intellectual. If some of the articles are related to a topic you’re about to elaborate, you can use them as inspiration. I suspect they are paraphrased from online sources, so don’t try to reference them – just use them as inspiration. 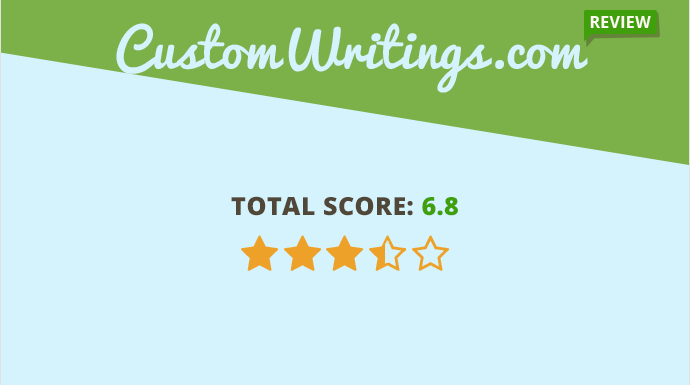 It’s time for my final thoughts about CustomWritings.com on the basis of review above: I would have been satisfied with the result if the content was unique. I’m not sure a student who pays for a creative paper would like getting such results. What are your thoughts on this company? Have you used its services? Do share! Unfortunately, I have to agree with the reviewer – this service sends rewritten content. I recognized huge chunks from a famous leadership blog in my paper. I always read that blog, so it was easy to see it was the same content, although the writer used some tricks to avoid plagiarism checkers. And the prices are high. How ridiculous is that? great issues altogether, you simply won a new reader. What would you suggest about other companies? When I had got my paper I though it was written by a child. And then they have rejected to rewrite it! Low quality writing. Unresponsive support. And no refund for a month! Terrible support, low quality paper and no refund at the end. Stay away from them!